i was walking around the sunday farmer's market yesterday morning in our old beloved town to pick up some leeks to make vichyssoise and a few other things for this week when i happened upon a dried wreath booth that truly took my breath away. 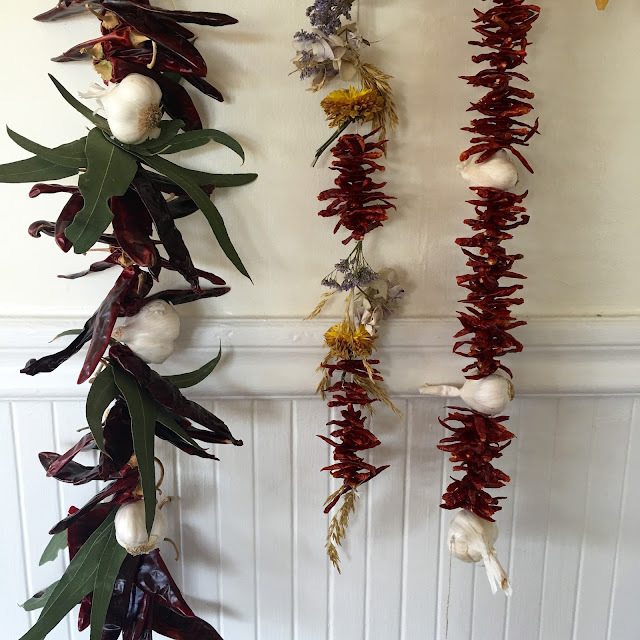 among some of the wreaths were strands of chili peppers and garlic, or "ristras" as they're known in mexico. while beautiful, the price tag was a bit steep ($60+) and i figured i could just make them my own for ninety percent less and perhaps make a bunch as gifts this christmas. honestly, it doesn't take much to inspire me. yesterday, it just so happened to be garlic and peppers. afterwards, i headed to a mexican market to get my peppers + garlic, and let me tell you - a giant bag of chili peppers costs less than two dollars! and fresh garlic cloves were less than a dollar a pound! you can't beat those prices, especially when using them to make a beautiful craft that will last for practically ever. anyways, on to the tutorial! i didn't google how to make these, and i am sure there a million ways that are far more professional, but i just did what came naturally and made the most sense. *warning: make sure you do this project away from children. the chili peppers break easily and their seeds can disperse all over the place. and they are hot! and make sure not to touch your eyes (i made that mistake a few times). start by cutting your twine in the length that you prefer. tie a sturdy knot at the end and start "sewing" in your ingredients in whatever order you like. i started with garlic on the bottom (simply insert needle on the side, your needle may not be large enough to go to the center) and then "sew" in your peppers (i like to stack them on the needle then gently pull them down). the peppers will naturally go every which way which makes it really beautiful once all together. 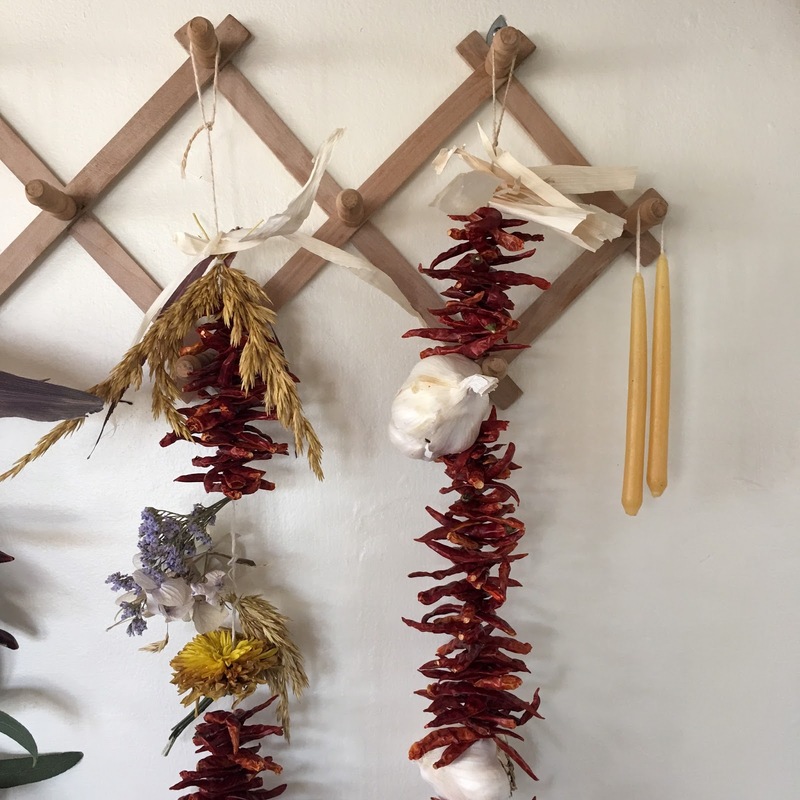 after you have about forty or so peppers, add in either another piece of garlic or dried flower and then continue with more peppers. 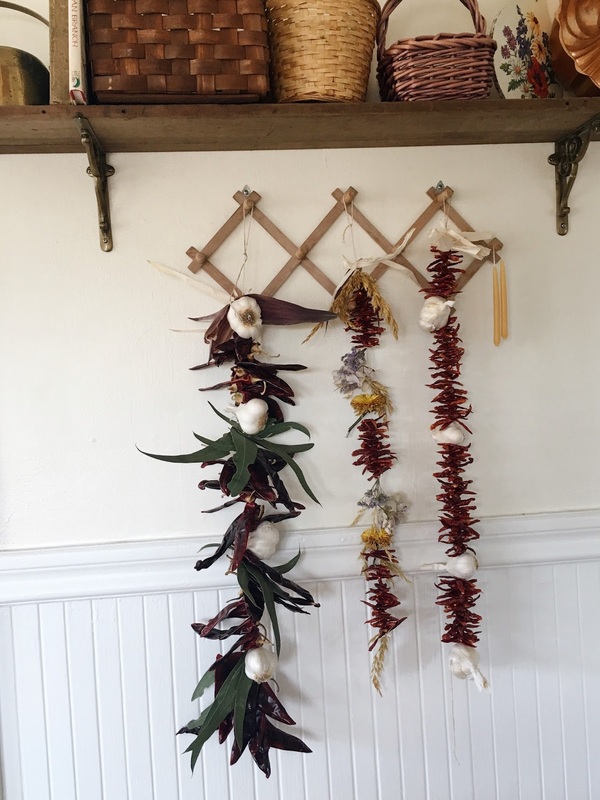 at the end, add your corn husks as a pretty topper. you can even tie it into a bow! 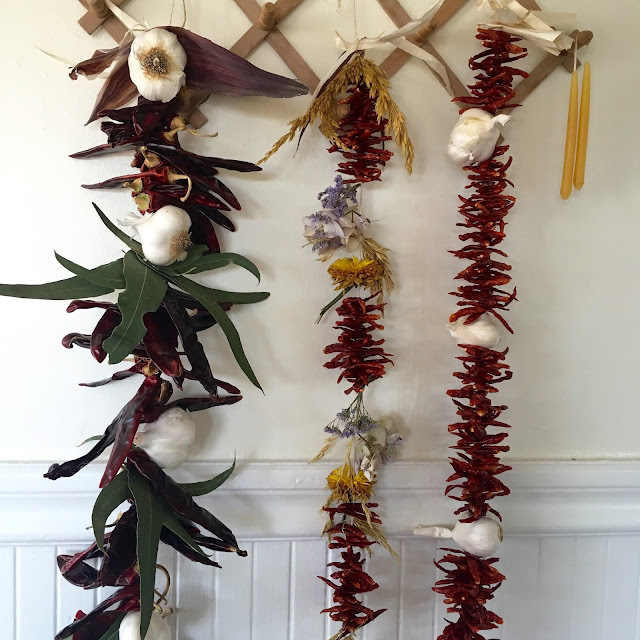 after the husks, make a sturdy knotted loop so it can hang. أفضل مواد عزل خزانات بمكة تستخدمها شركة العنود و التي تضم فريق متخصص حيث أنها أفضل شركة عزل خزانات بمكة المكرمة و بجميع أنحاء المملكة و تقدم لكم مستوي متميز . أفضل مستوي خدمة ستحصلون عليها من خلال تواصلكم مع مركز صيانة سامسونج الذي يعتبر من أفضل المراكز كما يضم مركز صيانة وايت وستنجهاوس أفضل فريق متخصص من مهندسين و فنيين . تمتعوا الآن بأقوي العروض و الخصومات التي تقدمها لكم مركز صيانة كريازي المعتمد و الذي يعتبر أيضاً توكيل كريازي من أكبر التوكيلات في مصر و التي تقدم لكم خصومات مميزة و بأرخص الأسعار. تواصل الآن مع أكبر مركز صيانة فريجيدير الذي يقدم لكم عروض و خصومات مميزة كما يقوم مركز صيانة جليم جاز بتقديم أرخص أسعار صيانة منزلية. شركتنا من اهم و أكبر الشركات بالمملكة التي تتبع طرق مميزة في نقل عفش الطائف حيث تضم الشركة فريق متخصص في فك و تركيب جميع أجزاء العفش بكل دقة و مهارة عالية. عرض القرض لدينا هو ضمان 100 ٪ إذا كنت جادا. تحياتي لكم جميع أخواتي وأخواتي ، نرجو منكم جميعاً أن تحظى بمباركة الله ، ونريد أن نستخدم هذه الوسيلة لإعلامكم بكل ما نوفره من ائتمانات سريعة وتمويل الأعمال العاجلة لتلبية احتياجاتكم.